As a company, WhatsApp has always had the mantra firmly against monetising its user base and said that it had never had plans to put ads into its app, but since its acquisition by facebook things have become a little hazy. While WhatsApp won't be turning out banner ads anytime soon, Facebook has looked at more passive ways to integrate WhatsApp into its larger ecosystem in a bit to monetise the hugely popular messaging service, which has around 1 billion daily users. 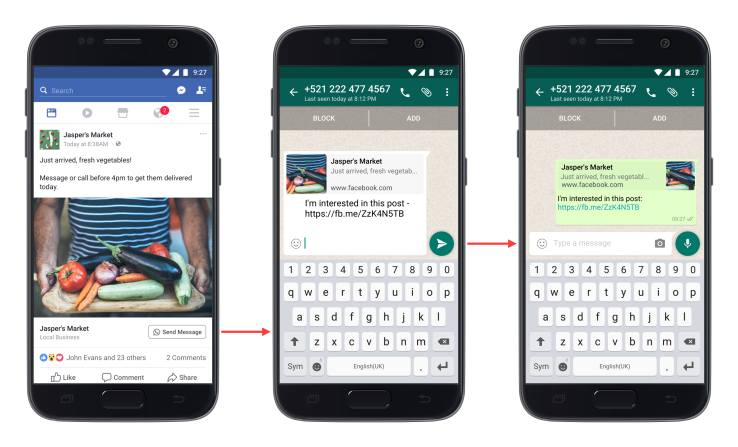 So it should come as no surprise that Facebook is launching a new ad unit that will let businesses create a link between the two platforms: advertisers can now include a button on their ads so that people can call or message via WhatsApp with the click of a button. There have been a few reports surfacing on the net with early sightings of the feature in test mode earlier, but now Facebook has confirmed to us that it’s rolling this out gradually, starting first with North and South America, Africa, Australia and most of Asia. Facebook has stated that more than 1 million Facebook Pages already include WhatsApp numbers in their posts each month, which implies that there is already a pipeline between the two companies being used by businesses more informally to connect with customers more directly. While in many developing markets, businesses are using their WhatsApp and Facebook pages as their primary points of contact for users, so this would make some sense to expand for Facebook, as the new White and Yellow Pages, respectively. Facebook Messenger began monetisation back in 2015 though “Click-To-Message” ad that lived on Facebook proper. Facebook Click-to-Messenger ads are a way to generate leads that allow you to instantly follow up on with Facebook users, engage and convert them into sales within their native messenger platform. When leads click on a Click-to-Messenger ad, they’re taken to a Facebook Messenger conversation with your business page. From there, they’ll have the option of tapping/clicking a pre-written inquiry (called a “Quick Reply”) that will send them into a live Facebook Messenger conversation with your business page. This was their first step for messengers money-making plans, and then later Messenger began injecting display ads into the inbox, which we all hope never happens to WhatsApp, holding thumbs. While messenger ads have been growing in popularity as Facebook fan pages become the go-to for my B2C interactions its reach is limited to only Facebook users. Adding Whatsapp as an alternative contact method will see a higher CTR from messenger ads and naturally Facebook will charge a premium to make its messenger ads seem like an affordable option. Making this a win-win kinda situation for Facebook.